Three new exhibits are on display at the OSA offices in Raleigh. The Offices of State Archaeology (including OSA Central Office, OSARC lab, UAB and Western Office) will be closed on Friday, December 23; Monday, December 26; Tuesday, December 27; and Monday, January 2. We hope everyone has a safe and happy holiday. Thank you! In celebration of North Carolina Archaeology Month as well as the ongoing research many undergraduate and graduate students have been participating in here at the NC OSA. 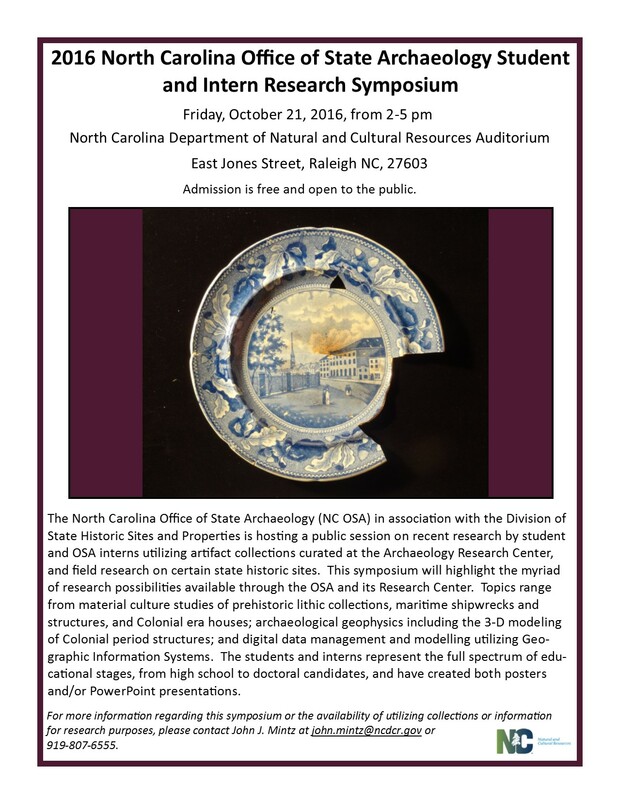 The Symposium will take place on October 21, 2016 from 2-5pm at the North Carolina State Library and Archives at 109 East Jones Street in Downtown Raleigh. Student presentations will last approximately 10-12 minutes. Popular TV shows such as "Bones" and "CSI" showcase ground-penetrating radar (GPR) as a tool to solve crimes. GPR is just one of the resources in the toolkit of 21st century archaeologists.